It’s about midnight Friday, Labor Day weekend in West Texas and I’m about to blow a great shot. My buddy Jared and I are in a huge 190 acre field of dry hay stubble parched after the harvest. Using thermal optics, we are looking at multiple groups of hogs making their way across, enjoying their crunchy evening fare. The half moon has barely started its traverse of the sky and Jared and I have stalked to within fifty yards of a big old sentry hog leading the group’s dinner outing. The hog is oblivious to our presence and heading directly for us. When it’s thirty-five yards out, we decide to take it. Knowing I’m testing the 208 grain Hornady A-MAX 300 Blackout Subsonic load from Gorilla Ammo, Jared volunteers to hold his shot but remains at the ready. I pull the ALG trigger on my Tactical Solutions TSR AR-15. Nothing but a very loud “click.” “Take it!” I whisper with urgency. Watching through an IR Patrol from IR Defense I observed what may be the best hog shot I’ve ever seen as the subsonic Gorilla Ammo load did it’s job perfectly. I’d waited for what seems like forever to take that shot. 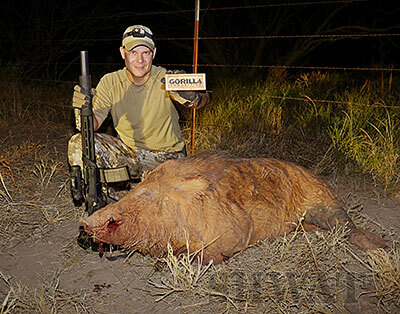 I’d hunted hogs with subsonic 300 Blackout ammunition before with less than satisfactory results. Less than satisfactory meaning I recovered zero hogs that hunt. I wanted suppressed subsonic 300 Blackout to work as a hog hunting round, but despite the hype it just hadn’t played out very will in real life. Jay Duncan at Gorilla Ammo had told me to expect good things from this load so I had high hopes when I squeezed that trigger on what turned out to be an empty chamber. If you ask Jared, he might confirm my state of mind as highly frustrated after I got a click instead of a bang. As much as the click aggravates me, the target hog remains blissfully unaware of us. Maybe the crunching of its dinner masks our brief conversation. Maybe it is the perfect weather it’s thinking about. After a hot August, my Kestrel 4500 with applied ballistics records a 93.5 degree moment with 31.5% humidity. If the sun was been out, we’d call that hot, but in the hint of moonlight with a slight breeze it feels warm and comfortable. In any event, I give Jared the shot. Fortunately, he is running the same 208 grain Hornady A-MAX Gorilla Ammo load in 300 Blackout that I am. He’s also running suppressed. He squeezes the trigger. 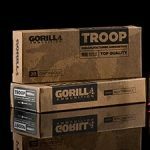 The primer explodes and ignites the powder in the Gorilla Ammo round. The bullet accelerates as the burning gases expand. But instead of exiting the barrel at 2300 feet per second or faster, the 208 grain Hornady A-MAX round meanders downrange at roughly 1030 feet per second. This eliminates the supersonic CRACK usually associated with trigger pulls. The powder burns quickly in Jared’s 8.5 inch barrel and the SilencerCo Specwar 762 suppressor muffles the report so well that the closest group of hogs merely falls back a couple hundred yards instead of vacating the field with urgency. WHAP! The round hits hog just behind its shoulder. You know the sound a balloon makes when you let the air out while stretching its neck? A high pitch that trails lower and quieter as the balloon runs out of air? That’s exactly the sound this wild hog makes. It never takes a step. It took about a second and a half to stand there and let the air out then it just fell over! I’m watching all this in incredible detail through my rifle mounted IR Patrol thermal monocular. Jared and I stare in disbelief as the rest of the group of hogs trots back away from us. I mutter something about being a professional as I charge my rifle. I spin around and sure enough, a little ninety-pound class hog is staring at us not more than twenty feet away. We both light him up with the subsonic Gorilla 300 Blackout and we have another hog down! There are still plenty of hogs in the field so we laugh and move in for the next round. The hogs are moving consistently, so we play the same game closing distance ourselves then letting the hogs amble our direction while eating. This time, the sentry hogs out front make an arc around our position but we engage them around 50 yards. I put the cross hair on a big sow. Jared and I squeeze off near simultaneous shots. My target pig drops like you’d turned off a battery operated toy. Jared connects but his hog is running for its life. I scan for targets of opportunity then return to my sow. Well in excess of 250 pounds it’s suddenly getting back up! “Oh no you don’t!” I declare as I double tap. I run to it and shoot it a couple more times for good measure, for peace of mind and because the quiet report of the subsonic Gorilla Ammo begs for more presses of the trigger. When close quarters hunting, I’m rarely a single shot shooter. I’ll shoot until I stop the target. Which of those of those shots actually convinced the big sow to shut down once and for all I don’t know. The adrenalin is pumping and Jared and I are yelling at each other about the downed sow and the other pigs we connected with who’d made it beyond the fence line. Scanning with thermal confirms we’ve taken the field. Nothing is showing up in our scopes. So we relive the evening as we make our way back to the midpoint of the field. I hike another quarter mile back to the jeep. It’s time for pictures and terminal ballistics. As I’m pulling up to the edge of the field thinking, “where’d I loose my knife?? ?” A blinking flashlight greets me. That can only mean one thing. I immediately shut down the jeep, grab the TSR 300 Blackout, fire up the IR Patrol and head for Jared’s position. It’s now after 4:00 a.m. and another group of pigs is dining at the far end of the field. It’s a really long walk. “Let’s go!” we agree. After walking most of the length of this 190 acre field we’re closing in on the group. This bunch is moving faster and perpendicular to us. We’re not going to get as close. We pick out pigs at roughly sixty-five yards. Jared begins the countdown at five, but I don’t have the shot I want. My target pig is pretty much squared up to me and I have no magnification. I hope to hit the pig in the chest. At zero I pull the trigger and connect. The big boar literally rears up – not quite like stallion in a movie, but not insignificantly either. He’s not done, he’s heading for the fence line. Jared is pounding a runner as I connect two more times with my boar. He’s running away from me at about a ten-degree angle, almost to the fence. Then he stops, lays down in a perfect pose fit for a German Shepherd and rests. The other hogs have made it beyond the fence and I’m slightly disappointed. We decide to let the big bore bleed out before approaching, but I grow impatient. As I approach the pig I see he’s enormous for this part of Texas! He’s probably the biggest pig we’ve ever taken here. What’s this? He’s tracking me with his eye?? That won’t do, we’re only eight feet from the fence! With my heart pounding I point shoot him repeatedly as he gets up for one last attempt to make it to the fence. He makes it, but gives up with only his giant head across the barbed wire. Jared and I celebrate. It’s now after five in the morning. I don’t know how far we’ve walked, but we’re tired. Still, we have to take pictures and cut out the bullets to see just how the subsonic 300 Blackout Gorilla loads performed. I’m excited to see how they did their job, but while I can find my camera I cannot find my knife. Guess I’ll have to put in an order for some more Gorilla 208 grain subsonic and do this all again! 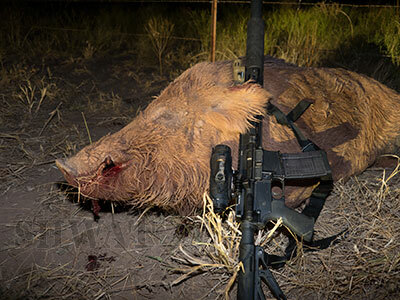 The lesson from the evening is obvious – when a reasonable distance to hog and good shot placement are married, the suppressed subsonic 208 grain load from Gorilla is quite effective. Not only terminally effective, but tactically excellent. The quiet report of the fired rifle didn’t run off the hogs which gave more opportunities engage their groups throughout the evening. And that’s what it’s all about! 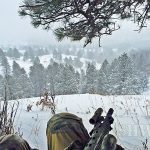 This entry was posted in Special Hunting Weapons & Tactics™ - The Center of Gravity for Tactical and Long Range Hunting and tagged 300 Blackout, 300BLK, Gorilla Ammunition, Hunting, wild hog hunting by Jonathan Owen. Bookmark the permalink.